It isn’t easy being born into a mixed family. My mum was Arab and my dad, Indian. The two cultures create a juxtaposition: loud and quiet, arrogant and sly, warm and colorful. But despite their differences, the views about a woman’s place in a family, in this world, remain the same: women are meant to be at the helm of a family, nurturing, caring, all soft curves and warm smiles with a round of bread baking in the oven. It isn’t easy to be strong when you’re a woman and told what that entails, what is expected of you. Regardless of the “modernity” of the family you’re born into, all women are at some point taught the art of being a girl. Smile and speak softly. Nod—whether you agree or not. Be charming and show grace. Do not wear boxy clothing but avoid form-fitting items—lest you want to be confused for the wrong sort of girl. Read books but don’t fool yourself into thinking heroines exist, it’s just to appease you. It isn’t easy being a woman of color in two worlds that don’t want you to display strength and yet all you have is iron in your blood and stone between your teeth. When your every cell is made up of opposites: loud and soft, arrogant and humble, warm and cold—there is no respite for the war inside your mind. There is no shield against the questions of your identity: Who am I? Where do I belong? Where will I find acceptance? I have suffered throughout my life with the burden of self-injury, suicide ideation, anxiety, self-doubt, and self-loathing. As a child, I spent years being bullied and isolated just by virtue of my “impure” Indian blood. On the Arab side, I was treated as a novelty child, so different and unique—but never quite the same as everyone else. Often, I find myself wondering what prompted me down the spiral of self-injury. Was it because I was dissatisfied with myself and felt the need to inflict pain upon so many different regions of my body? Or was it perhaps that I felt I deserved to be punished for being so fragmented and unwhole? Years of bullying at school caused the voice in my head to repeat those taunts over and over until the roaring in my ears was too great to ignore and I was translating them into my flesh as a permanent reminder. It may be that my skin is not fair enough for the Indian half of my family to consider me worthy, and it may be that my olive skin is too exotic for the Arab half. 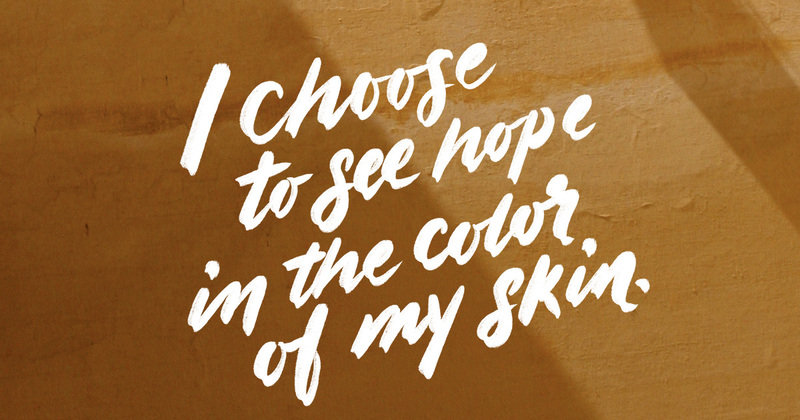 It may happen that my mum sometimes makes me buy a foundation two shades lighter than my skin tone so I can “let my pretty potential shine.” But that is immaterial because I am me and I choose to see hope in the color of my skin. I look in the mirror and see a fractioned being, split between two sides. Yet, I smile at my reflection because there is a strength to each piece and every side. The variety I have to offer is a genetic miracle, varying characteristics blending in synergy to create an evolutionary masterpiece. Science has shown us that skin color is a few cells making pigment. But pigment does not make me kind or good or courageous or awe-inspiring or heroic or any of the other adjectives I want to be. For me I only ever self-harmed when I felt trapped in a toxic environment or situation and didn’t know how or when I was gonna get out.